The Forensic Expert Witness Association wishes you a Happy Holiday season! 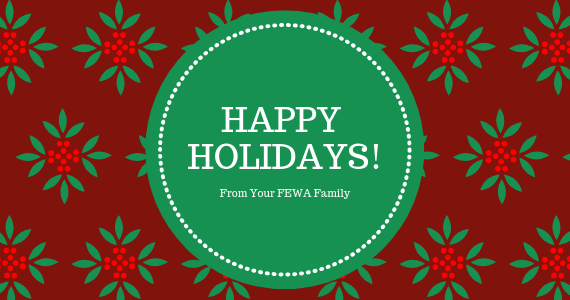 The FEWA National Office will be closed until Wednesday, January 2. The 2019 National Board of Directors was confirmed on December 7, 2018. The 2019 Officers and Board are eager to serve FEWA and its members, representing both the National Organization and our local Chapters. 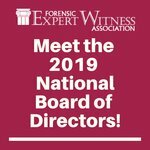 Your Board is an advocate for expansion of member benefits, strategic initiatives, and spreading the value of FEWA to fellow experts, consultants, attorneys, and others in the industry. The Board is looking forward to a successful 2019! Check out the 2019 FEWA National Board of Directors. FEWA is proud to announce a new member benefit launching in 2019, the FEWA Virtual Networking series! 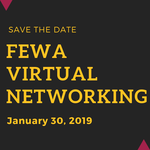 Learn more about FEWA Virtual Networking programming for 2019 and save the date for the first session on Wednesday, January 30, 2019. Howard Robin, MD is one of FEWA’s newest members and has joined the San Diego Chapter. Dr. Robin has directed anatomic, clinical and specialty laboratories in the hospital and commercial settings for the past 37 years. Dr. Robin is an immunopathologist with strong interests in toxicology, forensic medicine, cancer diagnosis, transfusion medicine, and immune-mediated diseases. He has worked as a pathologist in a coroner's office and has extensive courtroom experience. To learn more about Howard, visit his FEWA profile. Please join us in welcoming Howard to FEWA! December 31 Membership Renewal Deadline Approaching Quickly! This is a last reminder that membership dues are due by December 31 of this year to keep your FEWA membership active. Don’t lose access to the many member benefits available to you! Our improved online renewal process makes it easy to renew your membership, update your information, purchase an enhanced profile and change your Online Directory categories and subcategories all in one place. Click here to renew online or follow the link below for more member benefits and information on how to easily renew your membership. Many cases are won or lost on expert opinions. Expert retention is a subtle art, often representing one of the more significant and challenging investments a party makes in a litigation. Sometimes stories about body language can come across a little tabloid-like, and yet, it's hard to resist clicking on them, but body language has a very practical application when it comes to the criminal justice system. Relationships with a consulting or testifying expert and an attorney is a critical to a case. Mastering best practices when working with an expert is imperitive. Here are five best practices to keep in mind. A judge denied a plaintiff's motion to have struck a signature-verification expert in a lawsuit over a contentious business deal and alleged forgery. In the absence of rigorous science, psychologists disagree about using the neurobiology of stress to defend police officers who kill. See both sides to this important topic below. Why Do the First and Second Autopsy Results Differ? A police officer shoots someone dead. An attorney representing the grieving family calls me. The local coroner or medical examiner has already started the postmortem investigation, but this attorney wants me to perform a second autopsy while the results of the first are still pending. The first thing I want to know is, why? There is a shortage of real forensic pathologists. For many years there’s been no problem running into fictional ones who portray a false idea of life in the medical specialty and the real-life limitations of this branch of forensic science. No wonder so many people think they understand the medical practice of determining cause of death. Except they don’t, particularly if they think a medical examiner’s time is spent mostly on murder.